Martin Wallace grabs a fantastic theme with both tentacles in A Study In Emerald. Disclaimer: Treefrog Games kindly provided me with a review copy of A Study In Emerald. When it comes to atmospheric themes, it’s a gift isn’t it? Sherlock Holmes meets H.P. Lovecraft’s Cthulhu mythos. 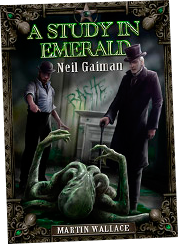 The idea probably popped into Neil Gaiman’s head in the shower, and by lunchtime he’d churned out an entertaining short story called A Study in Emerald, which you can read here. Go on, go read it, we’ll wait here until you come back. And so is, I’m happy to say, Martin Wallace’s game based on the story. Now I must admit at the outset that I haven’t played many of Mr Wallace’s other games, though if you check out his website you’ll see he’s designed around forty, including such well-regarded titles as Brass, Age of Steam and A Few Acres of Snow. 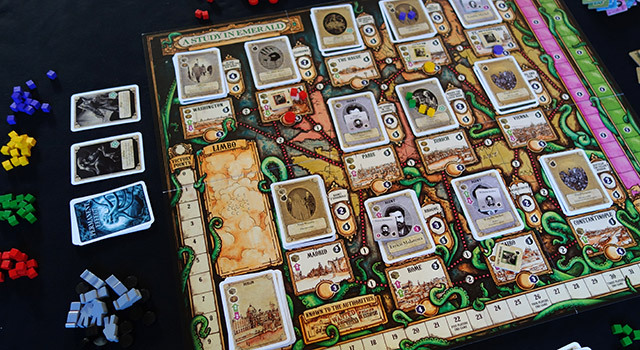 I did recently play one game of Discworld Ankh-Morpork which I found to be a fun, card-driven area control game. Which brings us to A Study In Emerald, a fun, card-driven area control game—with deck building and hidden roles thrown in. I was drawn to this one because of its theme, but thankfully the mechanics don’t disappoint. A Study In Emerald simulates the machinations of two groups in an alternate Victorian-era world conquered by Lovecraft’s Old Ones: the Loyalists (loyal to the Old One-dominated ‘royals’ and the existing world order) and the Restorationists, a semi-terrorist organisation determined to return mankind to hegemony over the planet. During a game, you’ll gather all manner of Victorian, Holmesian, and Lovecraftian-themed forces into your deck of cards, a deck which you will continually recycle in time-honoured deckbuilding fashion. Using these cards, you place influence on other cards so as to add them to your deck, increase its strength, and use their abilities to amass victory points. It’s a confusing jumble of a system at first, but it isn’t long before the sticky tendrils begin to clump together and everything begins to make sense. Unfortunately, understanding is not aided by a rulebook that feels like it jumps right into specifics without laying enough a strong enough groundwork of processes. It really is one of those games that you don’t feel you understand after reading the rulebook, and need a game or two to get your head around. So allow the Esoteric Order give you a précis. Players are secretly dealt a random card, kept hidden, to determine if they are Loyalists or Restorationists. You then choose a set of ten starting cards illustrated with your Main Agent (Agent Monday, Agent Tuesday etc) and a pile of influence cubes and control discs. The locations on the board get a number of cards placed on them depending on the number of players, with the top card turned face up, and two Permanent Effect cards are place faceup by the board. Each player chooses a starting location for their Main Agent token. You start with ten cards in your deck and draw five for your starting hand. The two actions you can take in your turn are driven by these cards, and mostly consist of obtaining more cards, which then go into your discard pile. As you run out of cards your discard pile is shuffled to form a new draw pile, and the new cards become available to give you more options and special abilities to choose from. Icons on the cards are ‘spent’ to perform various actions. You can place influence cubes on locations on the board (and on the Permanent Effect cards), using a number of cubes from your available stock equal to the number of cube icons on the cards you discard. This is either to claim cards, or claim control of cities (which are worth victory points). You can also retrieve cubes from the board (and from the Limbo space, where they go after you’ve claimed a card) in the same way. For your first action only, you can claim a card on the board if you have the most influence (from cubes and your agents, represented by tokens, who count as influence) on the card. You start with one Main Agent token, but some of the cards you will claim are extra agents with their own Agent token that you can move about the board lending its influence to your claims. Furthermore, you have a number of specifically named Double Agent tokens at the start of the game (and may get more later) and, most amusingly, these can be revealed at appropriate moments to claim control of other players’ agents. Playing cards with gold symbols allows you to spend gold to buy extra influence cubes to add to your available stock. And of course you can use an action to discard cards and draw new ones, and you can play cards to perform their special actions. Now that you’re thoroughly confused, allow me to set your mind at ease. There’s quite an array of special card actions available, which can be somewhat confusing at first. Some of them even lead to entire game-winning strategies, like placing a number of zombies on the board before you can be stopped by the other players, converting agents to vampires, or even sacrificing your own agents to Yog-Sothoth (doing so once gave me the game by getting me a few points out in front). You can assassinate other players’ agents and block locations from being used. There are also two other main actions that, like controlling cities, give players valuable victory points: assassinating and hiding royalty. And by royalty, we mean horrific Mythos gods and beasties, one of which is tied to each board location. This usually requires the use of hired assassins, and the matching of a defence value by playing cards and agents with a bomb icon on them. Conversely, hiding royalty keeps them safe from assassination attempts. In either case you’ll have come face to face with the big bads, and you must draw a Sanity counter which declares you ‘sane’ or ‘mad’ after the attempt—three of the latter and you must reveal your secret allegiance and may even end the game! Now that you’re thoroughly confused, allow me to set your mind at ease. This does come together, though you probably won’t be comfortable with what you’re trying to achieve and how to achieve it until your second game. By then, players will be studying the board to zero in on the most attractive cards to add to their decks, vying for influence in those locations, adding agents to their cause and wondering when the best time is to make it obvious whether they are a Loyalist or a Restorationist. This is a crucial point, because the game has one last scoring surprise up its sleeve at the end. Throughout the game some victory point scores will be obvious—those from controlling cities mostly. But at the end of the game, you also receive points depending on your allegiance—for assassinating or hiding royal personages, and the number of points on the Revolution (for Restorationists) or War (for Loyalists) tracks, among other things. And finally, if there are players on both sides, the side whose player has the lowest individual VP total is eliminated. So of course you may have a game-winning score, but if your fellow Loyalist, for example, has a terrible score, your side loses! This forces players to pay attention to the actions of their opponents, because it will do you no good to get out in front if those of the same allegiance are lagging behind. Graphic design-wise, A Study In Emerald is a strange beast, made up of some elements that work beautifully and some that don’t. The faux-Victorian illustrations on the cards are stunning, and exactly right thematically. But then the board is a bit of a mish-mash; I quite like the contrasting pink and green colours but the rendering somewhat is amateurish, and everything on the board ‘shouts’ at the same volume, resulting in a confusing and noisy image. It would have been vastly improved if the background map texture had been less obtrusive and the locations more obvious, providing some much-needed visual depth. 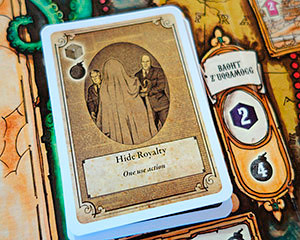 And for such a thematic game, the rulebook is basically designed and poorly laid out and feels like it was done in a hurry; an opportunity was missed to write and design the rulebook in such a way that really drew you into the theme of the game—pullout comments and examples by Holmes and Moriarty perhaps? Snippets from Gaiman’s story? It does feel that the entire game needed a bit more work to bring together the disparate styles and enhance the theme more successfully. But, as you no doubt know, as a graphic designer myself I will always have quibbles in this department. The production quality is excellent however, and the wooden zombie meeples are a particularly nice touch. Replayability is good too—since all of the cards aren’t placed on the board each game, you never know what you’re going to encounter in the location stacks. Euro gamers may be disappointed by the amount of luck involved in the card play, but this is mitigated by the many choices on offer, and besides, personally, a healthy dose of luck is not something that bothers me in games at all. What is enjoyable is the way players are continually coming into conflict by going after attractive cards, while at the same time individually developing card strategies and personal paths to victory. There is a strong sense of working towards your own goals, but you have to keep a weather eye on what other players are doing—not only to make sure they don’t win, but to deduce their allegiance and its impact on your final chance of winning. Despite the nagging feeling that everything including the kitchen sink has been thrown into this game, somehow it all comes together thematically and mechanically and results a fun, engaging and atmospheric experience to the end, with a nice sting in the tail when allegiances are revealed and final scores totted up. It may be that I’m a sucker for Victorian England-meets-Cthulhu, but I’m really enjoying A Study in Emerald. So, come dear readers, come! The game is afoot! Cthulhu fhtagn! Another tweak to my A Study In Emerald rules summary and reference (clarifying the use of the initial Assassin card) sees it at v1.2. Click the button below to grab the latest version. I have not possibility to buy this game. It is the plan to print this game in polish lang. ? I’d ask the publisher: Treefrog Games. A Study in Emerald is out of print everywhere, and Martin Wallace has already said several times that it probably will not be reprinted. Hey Kris, I read on Boardgamegeek recently that he is planning a new, ‘streamlined’ edition that will make the game a little more mainstream and smooth over some of the more complex rules. It will be interesting to see how much the original game is changed. Likes nice, and certainly a step up in the graphic design department, though I did really like those Victorian style illustrations on the 1st edition cards and think they should have kept them. It will be interesting to find out how the gameplay has changed. Looks much more generic in the art to me. The board in particular has me worried; it looks so much simpler than before; I think they have completely dropped the location mechanics. I also notice that on all the cities there are only up arrows for the tracks, no downs. I do like that there are ways to stop assassinations now; my group house ruled a method for this because the randomness of double agents is in no way enough to give players agency vs. just hoping they don’t get bumped off at the wrong time. I will be very intersted to see the new rule book. Yeah I get what you mean about it being more generic. They do seem to be going for a more Fantasy Flight Games vibe, and given the success of that company, who can blame them?